Introducing the bigger brother, the Trailer Valet XL! Trailer dollies are a dime a dozen, but they’re all big, bulky, and expensive. You’re either plugged to the wall or it’s too heavy to take to the campsite, but not the Trailer Valet XL. The XL is the lightest, toughest, BADDEST trailer dolly on the market today! Just like it’s little brother, it features the same high quality parts, an automatic brake, and dual 9 Inch tires, but we’ve also added some awesome new features. 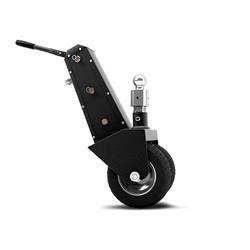 It’s the first and only dolly that allows you to move most trailers using an 18 Volt cordless drill; it features our patented ball attachment that connects directly to the trailer coupler and allows you to attach and detach in seconds; and finally, it’s the most compact and portable dolly on the market that can handle up to 10,000 Pounds of weight! So why spend thousands in getting something that you can’t take with you, and get the dolly that can actually get the job done.